van travels from Orange Park to JAX. 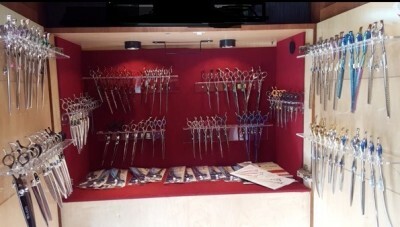 The mobile van is equiped with state-of-the-art sharpening equipment and procedures. I continually educate myself to remain on the cutting edge of technology. I am certified sharpener of beauty shears. I have been certified by BW Shears to sharpen on their HOYO JAPANESE sharpening equipment and specially trained by KIrk Boyd. I have also received special training by many old and new schooled sharpeners. Many of our customers testify that our sharpening procedure not only gives them the superior edge they need but often also provides a sharper edge than from the factory. 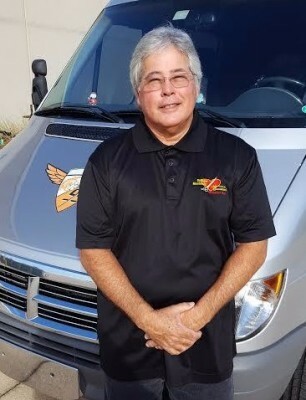 Being a mobile business, I am able to offer a special benefit that a lot of sharpening businesses are not able to provide in that our customers get their equipment sharpened and repaired on site while they are able to continue fully operating their business smoothly without waiting for the shipping delays! We serve an 80-MILE radius including Flagler, St Johns, Duval, Volusia and Orange Counties. Carey is the best! I've used him for my shear sharpening for the last 5 years. He's very knowledgeable and reliable. My scissors just survived a fire and I was unsure if they could be restored but Carey was able to clean and sharpen them and they're good to go again. Thank you Carey!! I'm a Hairstylists with over 30 years experience and very happy to have found Gary. 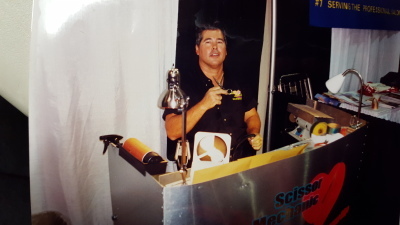 There are very few sharpeners on the east coast of Florida that can even come closs to the quality and expertise. Highly recommended. Don't risk messing up your scissors by letting someone you don't know sharpen them. Carey is excellent in customer service and is my go to person for all my sharpening needs. He also offers expert advice and spends the time needed to impart his wisdom and expertise to educate his customers.. in my 30 years as a stylist, he is the first person who has explained the value in purchasing a left handed shear. Very happy to have found such a gem to help me stay on the cutting edge of my profession at ShoreLine Hair Design. I highly recommend this company! I am also currently expanding our mail-in service to provide our high-quality sharpening services to previously unreachable customers as well as offer the convenience of choice to our existing customers. We understand that all our customers’ reputation relies on the quality of their tools. That is why I not only offer quality sharpening services, but we also ship every sharpening order back within three (3) business days from receiving it. We understand the importance of fast, reliable service, and we strive to treat our customers and their tools responsibly. To us a good quality tools is the first requirement for a great business. We strive to ensure our customers’ satisfaction, and will fully resolve any problems that may arise. We are confident that our clipper blade sharpening service and our scissor and beauty shear sharpening service is a cut above the rest, easy, efficient, and quick, as well as competitively priced. 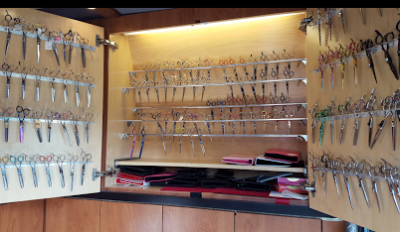 Carey Strickland, founder, and owner brings his Mobile Scissors sharpening and store to your office or business. Why send your equipment out and wait for the mail? We can come and finish the job in 30 minutes right at your location! Copyright ©2018 Sharper Edge & Carey Strickland. All Rights Reserved.